I know I am a bit out of the season posting this Christmas sugar cookies recipe, but then again, cookies are never out of season. 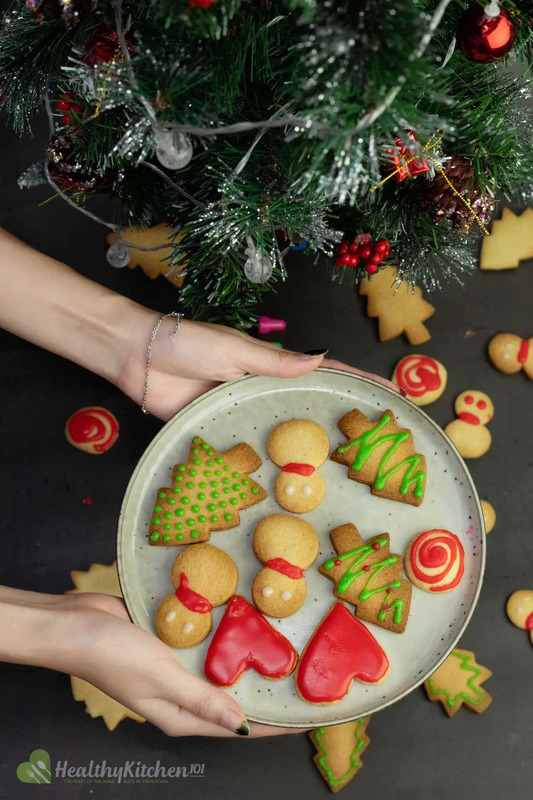 Besides, decorative cookies would make fun treats for any party, and decorating cookies would make a fun activity to get everyone in the kitchen lending a helping hand. For today’s recipe, I will be making both the sugar cookies and icing from scratch. Now I know the words “from scratch” may make some of you hesitate a little, but don’t worry. I will give you step-by-step instructions for this insanely simple recipe. Foreword: Okay, I am going to be honest with you guys: I have absolutely zero talent when it comes to decorating cookies or cakes. Therefore, some of them might turn out looking like the cute art project of a kindergartener. What Ingredients Do You Need To Make Sugar Cookies? And that is it! Simple cookies call for simple ingredients. That way, you can just whip up a batch of them without having to go the grocery store whenever your sweet tooth is kicking in again. And, unlike chocolate chip cookies, these sugar cookies doesn’t need to rise much, so you can just leave out the baking soda if you want. However, if you want your cookies to look more lively and colorful, you are going to need a few more ingredients to make the icing. How Do You Make Homemade Icing For Sugar Cookies? There is nothing easier than making your own icing, and no, I’m not talking about that fancy royal icing. I’m talking about the quick and easy icing that doesn’t contain any raw egg. All you need is some powdered sugar, water, simple syrup, and vanilla extract. Mix it all together and there you have it, sugar icing! Do keep in mind that you should only make the icing right before you are ready to frost your cookies, as the icing tends to dry out quickly. If you want to make it ahead, pour your icing into a piping bag and use it whenever you’re ready. Just don’t cut the tip of the piping bag, and leave it at room temperature. How Do You Get Sugar Cookies To Hold Their Shape? The answer is simple: Freezing your dough before baking. After cutting out the cookies, transfer them to a baking tray and into a refrigerator they go! Leave it in there for at least 1 hour before baking. If you’re in a hurry, put your cookies in the freezer for 15 minutes and they’re ready to bake. That being said, if you want your cookies to be beautiful for you to decorate, you should freeze the dough before you bake them. Don’t let the phrase ‘from scratch’ scare you. These sugar cookies are absolutely simple to make, and the sugar icing is even easier to make. Don’t believe me? See for yourself. In a large bowl, sift together flour, sugar, and baking soda. Then give everything a whisk to combine. In another bowl, add your softened butter and half of the flour mixture. Mix with a spatula. Once everything is combined, add the rest of the flour in and mix again until crumbs form. Add in the egg yolks and vanilla extract, and mix. Then, knead gently in the bowl with your hand until a dough is formed. Place a large piece of parchment paper on your work surface and place the dough in the center of the sheet. Place another piece of parchment paper on top of the dough. This will make it easier for you to roll the dough out. Using a rolling pin, roll the dough out into a circle, about ¼” thick. If you feel like the butter in the dough is starting to melt and the dough is a bit sticky, place the dough in the fridge for at least 15 minutes to firm up. Take the dough out, remove the upper layer of paper, and cut the dough with your cookie cutters. Gently remove the excess dough around the shaped cookies and transfer the cookies onto your lined baking sheet. Form the scraps back into dough and repeat the rolling and cutting process until there is no dough left. This recipe should make 24-30 cookies in total. Put the cookies in the fridge for at least an hour or until completely firm. Once the cookies are firm, preheat the oven at 400 degrees Fahrenheit and wait for the oven to come to temperature. Take the cookies out of the fridge, lower the heat to 375 degrees F and bake for 15 minutes or until your cookies turn golden around the edges. Leave to cool completely before you serve or decorate them. In a small bowl, mix all the ingredients until everything is combined and there is no lumps of sugar. Divide the icing into smaller portions and add different food coloring to the icing if desired. (*): If you don’t have simple syrup, you can just make your own by dissolving 100g sugar in 65ml water in a small pot over medium heat. As you will only need to use 45ml of simple syrup to make the icing, you can store the remaining syrup in a clean jar and keep it in the fridge for later use. To check the consistency of the icing, lift your spoon and let the icing drip into the bowl. The dripping should pour down in a thin stream, like a ribbon. When it hits the bowl, the ribbon should hold its shape for a few seconds before blending into the rest of the icing. If the icing is too runny, add a little more powdered sugar. If it’s too thick, add a tiny bit of water to loosen it up.